Alert.MyContestWinnerzs.eu pop-up is the PUP that uses misleading techniques to prevent removal. Use Reimage to locate malicious components and get rid of them faster than with uninstall instructions. A full system scan blocks virus reappearance and prevents traffic to malicious domains. How can Alert.MyContestWinnerzs.eu hijack my computer? How to remove Alert.MyContestWinnerzs.eu virus? Alert.MyContestWinnerzs.eu is a pop-up notification that may show up on your computer randomly and try to trick you in various ways. In most of the cases, it appears on every websites, no matter if you are making Google search or if you are browsing thru online stores, such as Amazon, eBay, Walt Mart and so on. Usually, Alert.MyContestWinnerzs.eu virus informs people that they were selected to participate in a survey and have a huge possibility to win certain rewards, such as iPhone, iPad, MacBook and so on. Beware that such and similar alerts look really convincing; however, you have to keep in mind that it's just a trick to swindle your money away because by completing the survey you will have to indicate your full name, telephone number and will subscribe some dubious service for which you will have to pay weekly. In most of the cases, people are not directly informed and do not suspect this. That's why they are negatively surprised after seeing an increased telephone bill. By the way, Alert.MyContestWinnerzs.eu popups may deliver you fake update alerts that may try to convince you that you need to update Java, Flash Player, Media Player, web browser or any other software. Be very careful because these updates are fake and after accepting them, you allow a potentially unwanted program, such as adware or browser hijacker to get inside. Finally, you have to know that Alert.MyContestWinnerzs.eu ads are caused by an adware and a potentially unwanted program, which not only slows down your machine, pose a risk of money loss and infiltration of other unwanted programs, but can also track you and your online activities constantly. Therefore, do not wait long if you have already noticed questionable pop-up ads. You should run a full system scan with Reimage or another reputable anti-spyware and get rid of Alert.MyContestWinnerzs.eu virus. Alert.MyContestWinnerzs.eu pop-up ads are closely related to an adware-type program. As we known, it is compatible with all most popular web browsers, including Google Chrome, Mozilla Firefox, and Internet Explorer. Thus, no matter which one you are using, you can start fake popups and surveys. There are numerous ways how potentially unwanted programs can infiltrate computers. However, typically they get inside the system along with free software. For example, when you install download manager, PDF creator, audio or video player or any other popular freeware, you may be tricked into installing a whole bundle of programs. That's because freewares allow they creators earn the money by spreading various add-ons, plug-ins, toolbars and extensions as additional components. The problem is that those additional components are, usually, disclosed in a tricky manner. Thus, every time when you are about to install a freeware, we highly recommend you to select Advanced or Custom installation option and carefully monitor the entire process. Check everything step-by-step and opt out of the check boxes that promote questionable applications. This, way, you will prevent Alert.MyContestWinnerzs.eu redirects, slows downs, pop-up ads, alerts and other annoying issues. Here, look for Alert.MyContestWinnerzs.eu pop-up or any other recently installed suspicious programs. Wait until you see Applications folder and look for Alert.MyContestWinnerzs.eu pop-up or any other suspicious programs on it. Now right click on every of such entries and select Move to Trash. When in the new window, check Delete personal settings and select Reset again to complete Alert.MyContestWinnerzs.eu pop-up removal. Once these steps are finished, Alert.MyContestWinnerzs.eu pop-up should be removed from your Microsoft Edge browser. Here, select Alert.MyContestWinnerzs.eu pop-up and other questionable plugins. Click Remove to delete these entries. Now you will see Reset Firefox to its default state message with Reset Firefox button. Click this button for several times and complete Alert.MyContestWinnerzs.eu pop-up removal. Here, select Alert.MyContestWinnerzs.eu pop-up and other malicious plugins and select trash icon to delete these entries. Click Reset to confirm this action and complete Alert.MyContestWinnerzs.eu pop-up removal. 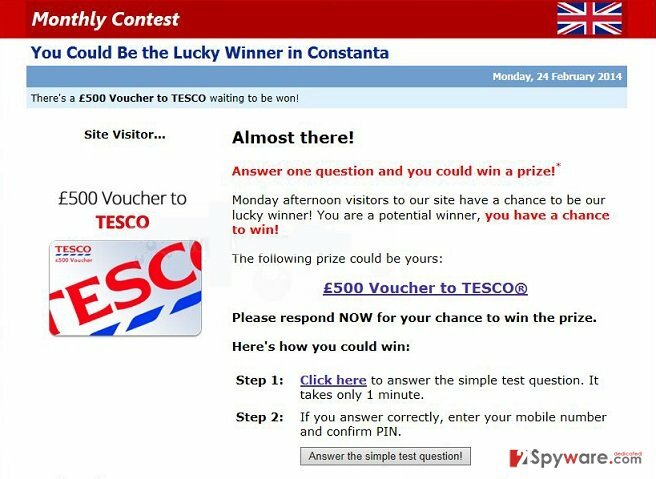 Here, select Extensions and look for Alert.MyContestWinnerzs.eu pop-up or other suspicious entries. Click on the Uninstall button to get rid each of them. Now you will see a detailed dialog window filled with reset options. All of those options are usually checked, but you can specify which of them you want to reset. Click the Reset button to complete Alert.MyContestWinnerzs.eu pop-up removal process. This entry was posted on 2015-01-20 at 03:09 and is filed under Adware, Viruses. You can quickly scan the QR code with your mobile device and have Alert.MyContestWinnerzs.eu pop-up ads manual removal instructions right in your pocket. How did you remove Alert.MyContestWinnerzs.eu pop-up ads?